If you keep up with Apple-related news, you’re bound to know that Apple is approaching 1 billion downloads at the App Store, and will be giving 13.000 USD worth of gifts to whomever either downloads the billionth app, or sends a form right after the 999.999.999th app has been downloaded. So, the question is: when will that be? Turns out the counter can help us have a certain strategy. On Tuesday (the 6th), Philip Schiller set out to deliver the last Apple keynote at MacWorld. Internet coverage was more than ample, from AppleInsider to Gizmodo, though some problems occurred (the live feed by MacRumors was hijacked by 4chan hackers, for example). I had an exam the following day, and a power cut right when Phil Schiller was on stage, so I was unable to follow it immediately. However, when I did read up about it, I was surprised by the reaction of some of those large websites who covered the event. Many things have happened these past days or will happen in a few days, and I thought I might as well write about them all in one go: King’s College’s conditional offer, studying for exams, watching an idiotic film, the announcement of a lack of a keynote by Steve Jobs at Macworld, the impending launch of MacHeist III, an interview at Allen & Overy for a summer internship and solving a legislation problem for the year below at university. All of these are completely unrelated, yet somehow linked in time. And when you write the bolded letters together, it gives the word “coseismal” (“relating to points on the earth’s surface affected by an earthquake simultaneously”). Coincidence? I think not! We’re doomed! Finally. It took me some time, because my law internship kind of broke the pace of things (wink wink nudge nudge), but I have finally completed reworking the glyph designs made by Dustin Schau for Mail.app and Preview.app in order to replace the “Aqua” ones that have existed for the past X years, and have compiled the whole thing into one package with automated installer & uninstaller and with manual installation instructions. So, what exactly do these glyphs look like? For the uninitiated, Apple launched the iPhone 3G a month ago, and with it came a software update for all existing iPhones & iPod Touches (well, I’ve no idea how to write the plural for “iPod Touch”). This software update was “the big one”, because Apple launched an application store (the “App Store”) accessible to all iDevices with that new OS update. As any self-respecting Apple fanatic, I promptly upgraded my iPod Touch. And boy, am I amazed at this thing. I’ve been studying all day for an exam I have on Wednesday, and I only started learning anything useful two hours ago. It so happens that this Monday, the WWDC kicked off with a keynote by Steve Jobs, the prophet who guides all Apple fans throughout the world. For the uninitiated, “WWDC” stands for “Worldwide Developer Conference”, and it is one of the major yearly Apple-related events. 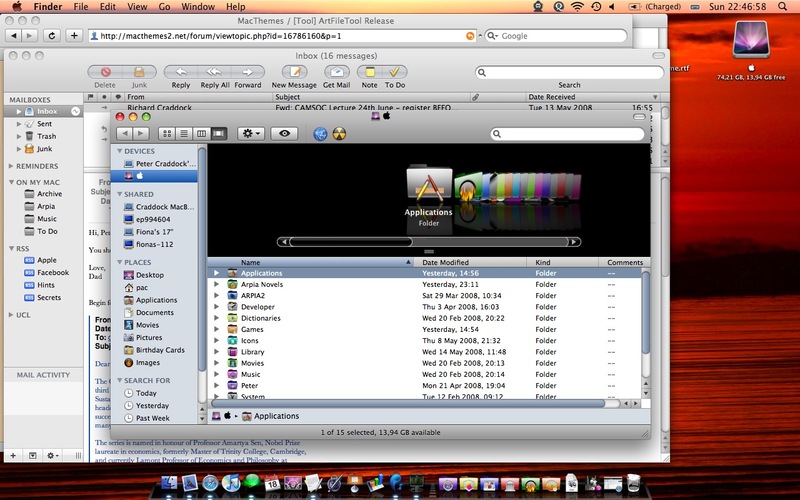 Last year, Steve Jobs showed the world a feature-complete version of Mac OS X Leopard, among others. But this year, big disappointment if you’re not much into the iPhone and were hoping for a sneak preview at “Snow Leopard”, the next version of the OS. Disappointment, but surprise right afterwards.